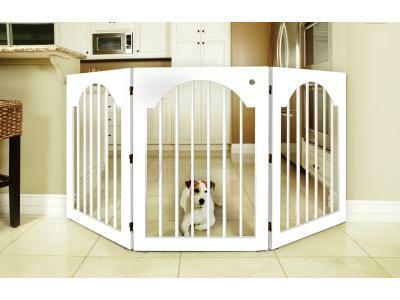 Majestic Pet Freestanding Pet Gate is ideal for keeping pets confined, while still keeping your home elegant. Built with solid-wood and triple hinge construction, these gates are both durable and versatile. Double jointed hinges allow the gate to be configured in either a C-Shape or Z-Shape configuration (as pictured). Gates are ready to use right out of the box, no assembly required. And, most important, no mounting to your walls, means no unsightly holes or smudges when gates are stored. Available in two elegant finishes to match any decor, Cherry Stain & White. Durable solid wood and steel wire (6 & 8 gauge) construction. 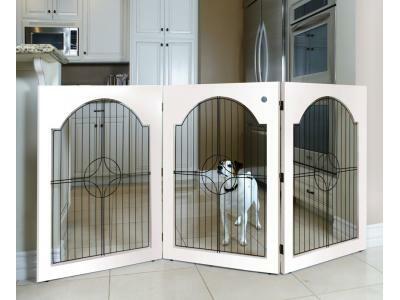 Gate is designed for use with pets up to 50 lbs.